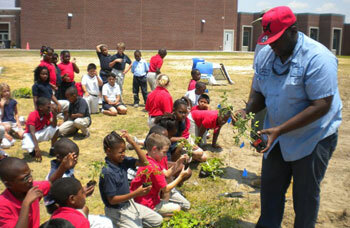 Lucky students at North Mitchell Elementary get to work in the school’s garden. And at “the North” all students are lucky. The rural southwest Georgia school serves students preK through fifth grade. It began the gardening program two years ago as part of an increased emphasis on health and wellness. 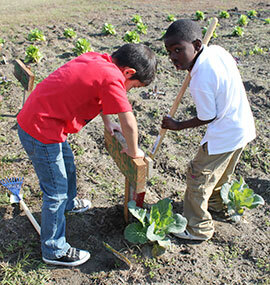 Students add plot identification signs and tend plants in the garden at North Mitchell Elementary. “The students are so excited by the garden,” says principal Jacquelyn White, adding that the garden presents many opportunities for teaching subjects across the curriculum. The garden has also been one way the school connects its students to their own communities. Local residents work with the school, helping to prepare the soil and talking with students about gardening. Each class has a plot for which they are responsible. 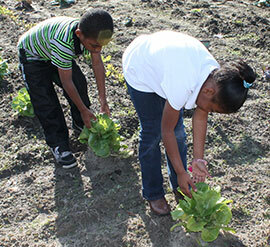 This fall the school grew lettuce, radishes, collard greens, turnip greens, broccoli, and cauliflower. Soon students will begin planting tomatoes, okra, beans, peppers, squash, sunflowers, and even corn. Adults will help tend the garden over the early summer. Some of the vegetables will be coming in when students return to class in late July. North Mitchell students are excited to receive plants for their garden plot. Some of the snack vegetables are local. White says that kids love eating raw squash—a traditional southern vegetable usually cooked stewed or fried. “Who knew kids would eat that,” she laughs. The garden and healthy snacks program are just two ways that North Mitchell Elementary supports academic growth by helping students get and stay healthy. 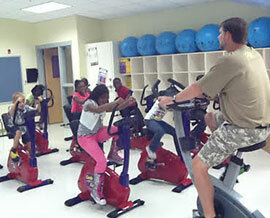 The school used a grant to install an exercise room. “Physical fitness had been put on the back burner,” mostly because of funding, White explains. “Now we have equipment, mats, jump ropes, fun exercise videos, and stationary bikes in all sizes,” she continues. Kindergarten students enjoy physical activity in North Mitchell’s new exercise room. Everyone working out on stationary bikes at North Mitchell Elementary School. All students work out twice a week as part of their health and p.e. classes. Parents sometimes come to school and exercise with their child’s class, and classroom teachers are encouraged to use the equipment with their students through the week. “The kids love to see their teachers using the adult bikes with them,” White adds. Mitchell County Superintendent of Schools Victor Hill explains that a daylighting building is one that harnesses natural light to best effect throughout the day. “There’s better visibility and less strain and fatigue when you can see well. The research suggests that’s good for your brain and your long-term health,” he says. Daylighted buildings with natural views are also linked to better behavior and mood, increased productivity, and positive outlook. “And, the school is more sustainable and saves money on energy,” Hill adds. North Mitchell Elementary, a healthy school flooded with natural light. As an expression of its commitment to connectivity in all senses of the word, Mitchell County launched a systematic effort, beginning about ten years ago, to build its technology infrastructure. Five years ago it began beefing up classroom technology. Now the school system’s high speed internet is one of the fastest in the state and schools are rich with computers and other technology. North Mitchell’s building is part and parcel of this commitment. “It’s unbelievable all the things the building can do,” observes White. All these efforts have paid off academically as well. In 2012, North Mitchell Elementary was recognized by the state as a Reward School for high progress.